There was quite a symphony going on this morning while Doug and I were lazily waking up. The Russian Olive Trees are starting to ripen; the birds are in celebration mode and woke happily to feast but that was a mere background beat. The dog was stirring, shaking her body awake and Bitty Kitty was chasing after the reflection that scooted across the floor as the sun came in through the window and hit the fan oscillating back and forth. Tagger was persistently voicing his disapproval of our sleeping in by meowing away that it was in fact time for breakfast. And, the crescendo (I can’t help it) was the alpacas next door mating. Those were the sounds of our lazy Saturday morning – gotta love the country! Day 331 was created in fabric, mesh screen, gesso, graphite, thread, and acrylic paints. 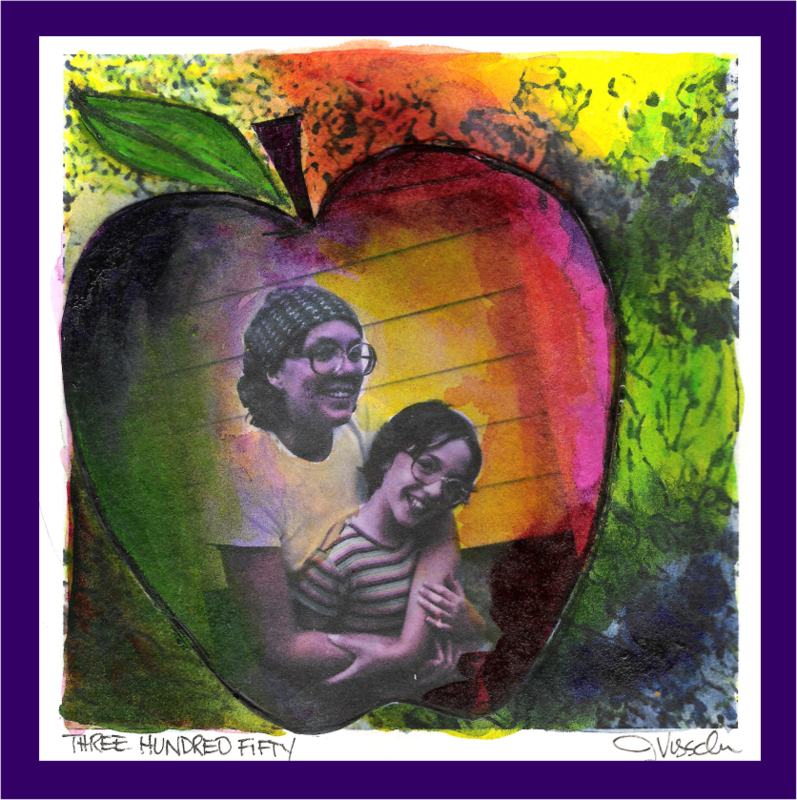 “Really love your… apples, want to shake your tree” – Steve Miller Band, with a slight improvisation. This song takes me back and makes me sing it in the goofiest of ways, swaying my hips and hearing the tune in my head. If fact, since I decided to post this apple and topic today, I can’t stop singing “waaaaan wooooow” and “oooee Baby.” I can’t carry a tune so… I sing anyway! Honey – “You’re the cutest thing that I ever did see!” LOL! Even when you don’t put the Salt & Pepper away – humph. Day 321 was created in mixed media collage and acrylic paints. 1. Countdown – 44 days to The Big Apple Paint-A-Thon! 3. Process Photo of the Day – The cat kept me from painting! 4. Check out the new and improved emails from – The Daily Apple! If you haven’t already done so, please sign up to receive apples in your inbox. The New Daily Apple will include information that I don’t post on my blog including art, health, and of course… apples and whatever strikes my fancy 🙂 Take a look at a sample and sign up! I first saw this quote a few years ago on my step-daughter Amanda’s facebook page and I was thrilled. Thrilled because I loved the quote but thrilled mostly because I felt so proud of the woman she had become. Leaping isn’t an easy concept, in fact it is darned hard every single time we do it. But, believing in leaping did allow for Amanda to move across the country in hopes of a job and something a bit different, it did allow her to persist in her pursuit of her MBA despite the challenges with financing an advanced degree, and it did allow her to make it the 9 miles she hiked this past weekend in preparation for a trip out to Colorado to climb her first 14’er. And isn’t that it with most difficult situations in life. We can leap, face adversity and unknowing head on, and finish because that is what we have to do. I loved to push myself before being diagnosed with AS. I did some crazy things to prove to myself that I could do physical things. I think I knew quite young and many years before I got very sick that things with my body weren’t quite right so I pushed and climbed, and skied, and jumped. And I’m grateful for every insane thing I did because now I know that my mind and my body really mean it that I can only do so much. I will still push myself only it will be in a different way. Day 319 was created in pen & ink. 1. Countdown – 47 days to The Big Apple Paint-A-Thon to raise money for AS Education! 3. “AS” the World Turns – Fellow AS Blogger launched a new site today! 4. Apple Update – tattoos anyone? 5. Check out the new and improved emails from – The Daily Apple! If you haven’t already done so, please sign up to receive apples in your inbox. The New Daily Apple will include information that I don’t post on my blog including art, health, and of course… apples and whatever strikes my fancy 🙂 Take a look at a sample and sign up! I guess this sums up where I’m at with my Art Apples. Drew this in my sketch book and tore it out to scan. I’m so happy to be home for a visit and I love being in Maine! Tomorrow we head to Vinalhaven for the weekend for family, wine, and lobster! Wow – I was delusional as to how long this would take. Four hundred pieces of quarter inch cut outs from magazines – what was I thinking? Doug got home around 10pm and sweet wonderful man that he is started searching for colors for me. The edges were the most difficult. But, I love the results. Hope you all like it too!